Every corner on every street in Burano is extremely photogenic. The photoshoot actually ended up becoming pretty difficult because all of the locations that we stumbled upon worked so damn well. Beware, this island is not for the indecisve. I decided to pair the clean and crisp white Helena Top with a more vibrant mustard button-front midi skirt from Soprano. Because this top is cropped and shows more skin than I'm used to, I knew I wanted to pair it with a pair of jeans or a high waisted skirt. But because it was nearly 100 degrees in Burano that day, I really didn't want to slip on a pair of jeans. 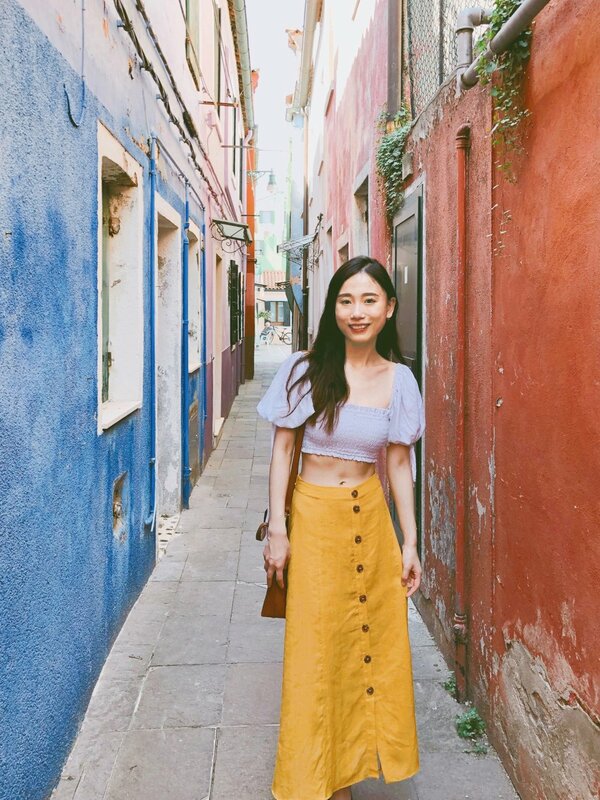 Luckily, the brightness of the skirt blended perfectly within the bright colors of the Burano houses. And yes, I was one amongst many girls taking photos on the island with their "Instagram husbands." Curious to see more of Burano and Venice? Check out my vlog and photos in this post.